People often associate neutral colors with the word boring and I personally don't get it. I find neutral combinations very elegant, polished, chic, professional and yet, they tend to look effortless. Please don't get me wrong... I love colors, but I love neutrals just as much. 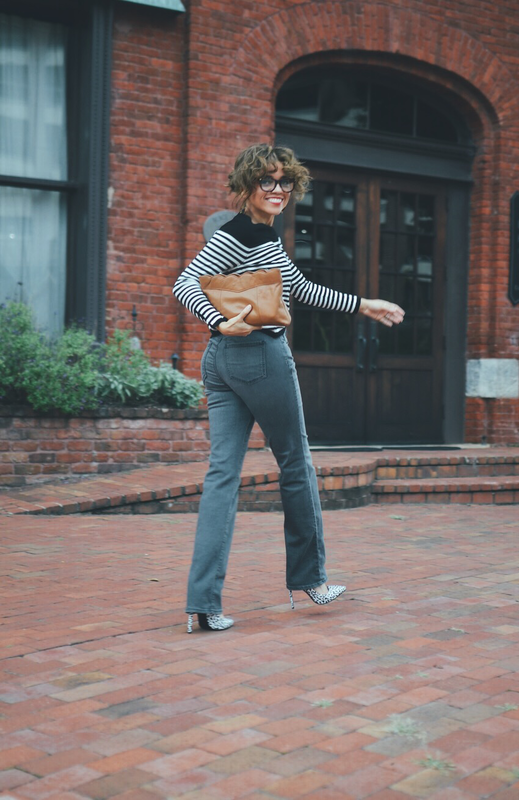 Wearing a look with neutral colors can very fun because you can play around with more than one print without looking too complicated. For the look I'm wearing today, I used two different strategies in order to make it interesting. As you can see, there is a mixed print going on with my pullover stripes and my cheetah-print shoes. 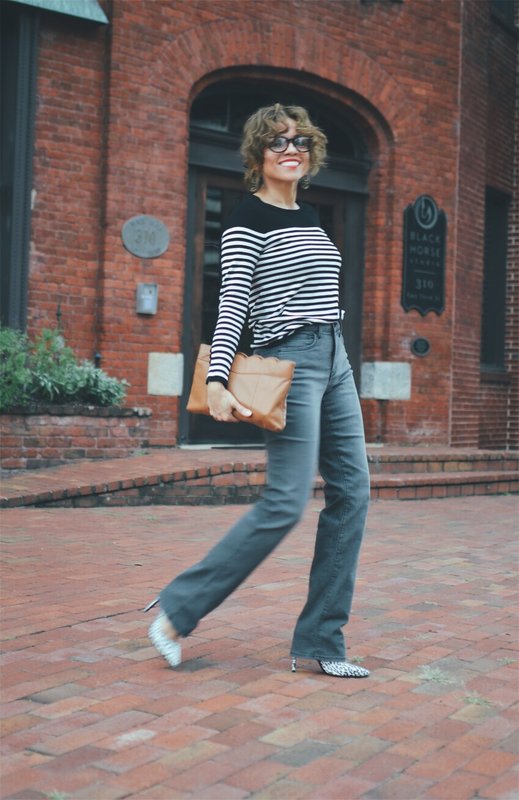 I also created a subtle pop of color by pairing my outfit's cool neutrals pieces with a warm-colored bag, that happened to fall into the neutral-color category as well. See, there you have it! ...two fun formulas or strategies - whichever you want to call them - applied to one neutral look that made a nice 👌 difference. And talking about difference! Do you noticed that I'm wearing clear glasses instead of sunglasses 😲? Yep!! I now need reading glasses to find out what those tiny words say on restaurant menus, and sometimes on my phone and in magazines. So far, I'm using magnification 1.00 and hoping it doesn't get worse. I decided to do this shoot with them because I wanted to see how they look on me. I know reading glasses are only for reading and not for galloping around (boy, did I learn that quick) otherwise, you will see everything that's far too blurred, just like the movement effect in these photos. By the way, did I say movement? My goodness! 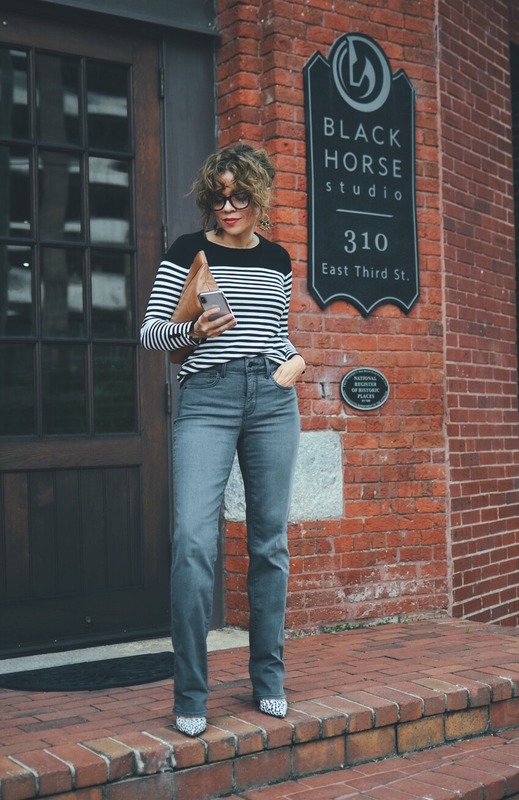 The jeans I'm wearing today are nothing but made for that and also for making your curves look dangerous 😉 These jeans color, cut (perfect with heels), rise and fabric are right up my alley. I really don't remember the last time I owned a pair of grey jeans, but I'm definitely liking them again.